The right tamper is often overlooked as an important part of brewing good espresso. And while there is a lot to be said for having excellent beans and pure water, correctly tamping is a key part of making a great shot. The difference between making a bitter or watery cup of espresso can come down to the quality of tamper and your ability to use it correctly. In this guide, we will cover what a tamper is, types and sizes, how to use it, and what to look for when buying a tamper. It’s a tool with a flat (for the most part) surface that presses coffee into a compact cake before water is forced through it by an espresso machine. In a more complex concept, the tamper is the last thing to touch the coffee, and your last chance to put the finishing touches on your coffee before it hits the cup. Most high-quality tampers have stainless steel faces and a bit of weight in hand. The handle may be made of a variety of materials ranging from hard plastic to custom hardwoods from the far reaches of the world. The size differences go far beyond the handle. The working face of the tamper can range in size from as small as 49mm as used some older machines like the Elektra and Olympia lever machines, to the more common 58mm that is widely used. For a while, there seems to have been an understanding that the perfect tamp must be exactly 30 pounds of pressure and that anything more or less falls outside an acceptable range. I don’t believe this to be the case. Not all of us can gauge and perfect 30 pounds of pressure when tamping. However, I don’t think it’s as important as making sure that your pressure is consistent and even. Making sure that you tamp straight down will help create a coffee puck that is sturdy enough to handle the pressure of your espresso machine. A calibrated tamper, such as the LuxHaus 57mm calibrated espresso tamper, is one to consider for those who don’t have time or patience to master any sort of pressures. The idea is that it will only allow your selected pressure to be applied each and every time you tamp coffee. As per WholeLatteLove, tampers can come as either convex or flat. Convex tampers have a slightly rounded face while flat tampers have a flat face. Which is better? Convex tampers may have a slight advantage because they can help reduce water from “side-channeling” through the portafilter which will lead to watery coffee. Personally, I don’t think it makes much difference, and the focus should be on creating an even tamp rather than face of the tool that you’re using. Tamping espresso into the portafilter seems like it would be difficult to mess up, but the subtle movements and differences in pressure can make all the difference when looking for the perfectly pulled shot. The tamping begins with a clean portafilter and a fitting tamper. Once you have everything clean and dry, add the measured amount of coffee to the filter basket and create a flat surface by smoothing the excess grounds with the flat edge of your hand or spatula. Push the working face into the tamper into the filter basket and push straight down. Once the desired pressure is obtained, with a little twist of the wrist, remove the tamper straight up. 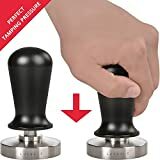 Calibrated espresso tampers will compress with a satisfying click when they reach a certain pressure, usually 30 pounds, but manual tampers will not. After your coffee is pressed into the portafilter gently tap it with the edge of the tamper. Never use the face to knock grinds off the edge back into the basket. Some people use the handle of the tamper. When all of the grinds are in the basket, and the rim of the portafilter is clean, press again with just enough pressure to flatten out the top of the puck and smooth the surface. Some baristas, spin the tamper in the portafilter before removing it, thus “polishing” the puck before attaching the group set to the machine. I haven’t found this to produce a better cup of coffee and I don’t personally do it, but it does look nice for a split second before being attached. Tampers come in all shapes, sizes, and weights, and are often designed more for the user than for the machine. They come in a variety of finishes, colors, and materials to fit personal demands, and much in the same way that a chef’s knife is used over and over, a good tamper will be used thousands of times without causing any discomfort. An ill-fitting tamper can cause serious wrist injuries, as well as being a regular annoyance. Much like any other tool, it is important to get up close and personal with several options and feel their weight and shape in your hand. Press down on a counter with them and make sure they feel good when they’re used. Ultimately, a tamper needs to compress coffee evenly to ensure proper brew in the remainder of the brewing process. Tampers most often come in sizes from 56mm to 59mm, but they can sometimes be as small as 49mm, and you'll want to make sure that whichever one you buy will fit without sticking. Double and triple check the circumference of your portafilter before investing in a new one as they can get quite pricey. A slightly small tamper can do the job, but one that is too big will never work. There is also always the issue of cost when choosing a new tamper. Saint Anthony Industries, for example, produces some of the best tampers, but the “The Statesman Tamp” is not only beautiful but isn’t for those on a budget. There is a lot of debate when it comes to the shape of the working end of a tamper, but in the end, they all do the same job. They all use the same mechanics, and they all tamp ground coffee, but the subtle nuances can make a big difference. The fit of a tamper in your basket is important, but the fit in your hand is even more important. The tamper should feel like an extension of your hand. You will eventually find something that works well for you. Unfortunately, you may also find yourself with a nice little collection of tampers before you know what happened. Do you have a favorite tamper? We’re always on the lookout for new products and ideas. Let us know in the comments with your favorite tamper and tips to help fellow coffee addicts tamp coffee for that perfect espresso.